While I'm certainly not the first person here on Destructoid to talk about Grand Theft Childhood, it's mostly been relegated to highlights of others' discussions or a mention on Podtoid. As per usual, I blame Japan on keeping me from reading my copy of Grand Theft Childhood, as I just finished the book earlier this week. So for this iteration of Weekend Reading, I want to dive into a discussion of the book and its message. For those of you who don't know what the book is, it's the summary of research performed since 2004 by two of the directors of the Harvard Medical School's Center for Mental Health and Media on the effects of videogames on youths. The $1.5 million study was funded by the Department of Justice. Just as a side note, if you've enjoyed Weekend Reading here on Destructoid, I'd like to announce that Japanator is now running its own Weekend Reading column on Saturdays. This week, we're discussing the cult of fansubs and their impact on the industry. We also take a look at how the various American companies have responded to the fansub culture as well. It's a rather lively discussion, so please be sure to check it out and join in. Well, let's get into this. I'll admit this up front: I had my feet firmly planted in the ground on the violent videogames issue long before I picked up this book. I couldn't see a realistic connection between violent videogames and youth violence. To me, the arguments always seemed to come from someone who had never sat down and played the games they were demonizing, and backed up their claims with studies that I had never heard of. So the text in Grand Theft Childhood was preaching to the choir. The overall message in the book, as you might be aware, is that there is no definitive connection between violence and videogames. 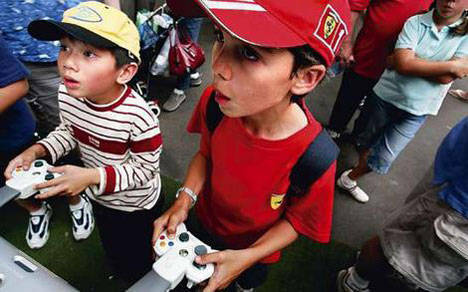 The two doctors, Lawrence Kutner and Cheryl Olson, conducted research in South Carolina and Pennsylvania, interviewing over 1,200 middle school students and 500 of their parents as to their videogaming habits, social situations at school, along with personality and behavioral questions. What didn't surprise me was the fact that videogames have now become the norm for children, and not playing videogames is now the exception for children. Videogames act as a major social lubricant, where kids can argue over which Pokemon is better, or try to put their heads together to figure out how to beat a level -- it can create new friendships and develop social skills. 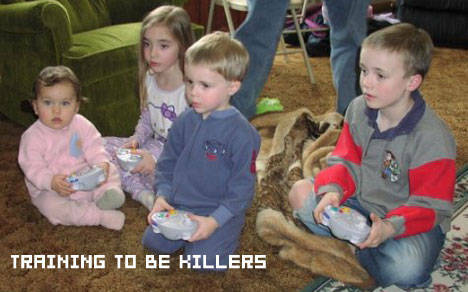 Also, a lot of gaming that kids do is with each other. That should sound familiar to most of us here on Destructoid -- I can remember going over to my friend Andrew's house in order to play Zombies Ate My Neighbors or Batman, and marveling at how cool the games were. Some of the statistics were more interesting to me. Namely, that girls were more likely to play ultra-violent videogames, parents with Masters and Doctorate degrees were more likely to let their children play M-rated games, and that most of the games kids had in their Top 10 played games list were mostly sports and action games. Halo and GTA made it onto the list, of course, but nothing like Manhunt or Metal Gear Solid was listed. The biggest highlight for me was reading the kids' testimonies. All of the kids showed a clear distinction between what went on in the videogames and what can happen in reality. This was a distinction I always wondered if kids would make at that age. I know I could, but at that time, I was going through Final Fantasy VII on the PlayStation -- hardly as realistic-looking as current-gen titles. Now, besides the research itself, the book also takes a look at past studies in videogame violence, as well as the media response to teen violence and the blame put on videogames. Let's tackle the other studies part first. The book takes a look at some of the studies that have purported there to be a connection with violent videogames and teen violence. Most of these studies either barely dealt with videogames (and instead dealt with "violent media," focusing on TV and movies), or were clinical and assigned an abstract value to what displayed "more" or "less" aggressive behavior. The parts of the book that deal with mass media's coverage of teen violence and the blame put on videogames are something I had a problem with. In both the research and media sections, the authors were rather vitriolic in their criticisms, and it was as though I could feel a particular hatred for these criticisms of games. While the authors state that they have no biases at the beginning of the book, the fervor with which they attack Jack Thompson, the NIMF, and others is surprising -- I wouldn't expect this level of vitriol out of what is supposed to be a supplement to scholarly research. In essence, the book provides a good presentation of their information, but in an attempt to contextualize it within the setting of videogames in the modern world, the authors start to overreach themselves. They take a tone that is clearly preferential, and leaves a bit of a bad taste in my mouth. The book is an important thing to read, though. The research data is an invaluable tool to have if you ever find yourself in the argument of violence in videogames, plus it touches on child development and what's necessary to look for. While videogames don't cause violence, kids with a predisposition to violence are probably attracted to videogames, and it can worsen the state that they are in if they're already troubled. Check your local library to see if they've got a copy of this book. They might even have other things interesting to read, too. For those of you who have read the book, what are your thoughts?